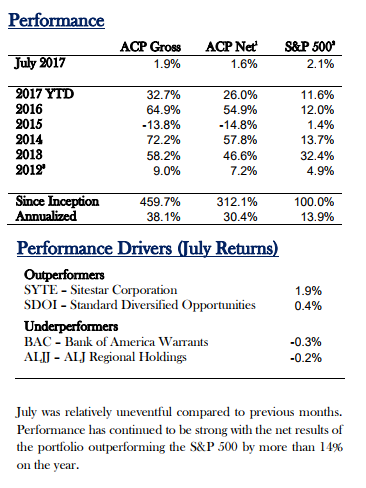 Arquitos Capital Partners returned 1.6% net of fees in July, bringing the year to date return to 26.0%. Since its April 10, 2012 launch, the fund has provided an annual net return of 30.4%. Separate from performance results, I want to highlight a project in which you will likely have interest. My friend Tom Jacobs spearheaded a campaign to republish the works of Maurece Schiller. After a Kickstarter campaign and other financial contributions to get the project off the ground, Tom is on the verge of publishing the first of five Schiller books on special situation investing. I had not previously been aware of Schiller's contribution to investment analysis and learned that his books, originally published more than 50 years ago, were the foundation for the style of investing that Arquitos has successfully employed.